Classes will be at Midwest City High School Forum located at 213 Elm Drive MWC, OK 73110. You must RSVP to Jason Cox, MCHS Athletic Trainer, at jcox@mid-del.net or (405) 739-1741, ext. 5139 to reserve your spot for the class. If you are interested in becoming an adjunct coach for Mid-Del Schools, please contact Kisha Grace at mgrace@mid-del.net or (405) 737-4461, ext. 1261 to schedule an appointment to fill out an adjunct coach packet. Please be sure that you have permission from the site first, before contacting the Administration office. Adjunct coaches must complete all necessary requirements before they are allowed to coach. 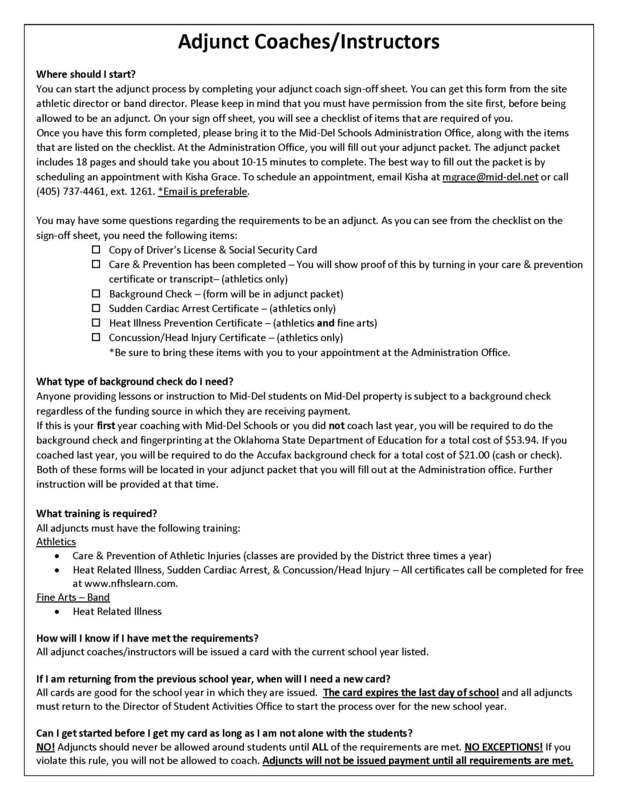 Mid-Del Public Schools Athletics is pleased to announce that athletic forms will be completed online. These forms may be accessed from any computer or tablet. All students participating in Mid-Del Schools athletics programs are required to complete the forms and physical in MAY, before they will be permitted to participate. This includes managers. The OSSAA PHYSICAL FORM will continue to be filled out on paper. This document is provided in the left hand section of this page.